Art Blooms: April 26 - May 10 ~ Art Exhibit, Earth Festival and so much more! All events take place at Croft Farm, 100 Borton's Mill Road. The Cherry Hill Arts Board is seeking artists for their annual Juried Art Exhibit. Open to all artists, Cost is $10 per entry (maximum 3 entries per artist). Features original two-dimensional works in watercolor, pastels, oils and more. All artwork is available for sale. Artists will be on hand to meet and discuss their work. Artist awards will be given and light refreshments will be served. A free-thinking art professor teaches conservative 50’s Wellesley girls to question their traditional societal roles. A sandwich and tossed salad lunch will be served before the film. Enjoy a lively afternoon with talented musicians from the Academy of Vocal Arts, Philadelphia Orchestra and Ocean City Pops, led by musical director William Scheible. This concert will bring you the music of great Italian singers from Puccini through Sinatra. The Cherry Hill Historical Commission bring you the history of entertainment in Cherry Hill. Light refreshments will be served. Don’t miss this evening performance by The Luck Brothers as they bring you blues, soul and classic rock & roll. The band has written songs for, performed and recorded with Lou Rawls, Sister Sledge, BeeGees, Anita Baker, Lionel Ritchie and more. a.m. through the adjacent Barclay Farm neighborhood. This day will be filled with entertainment, informative displays, activities, vendors and food. be served and lawn games played. *Seating is limited so RSVP your attendance to 856-488-7868. April 26: 10 a.m. - 2 p.m. and 6 - 8 p.m.
* Please call 856-216-0669 to confirm gallery times. 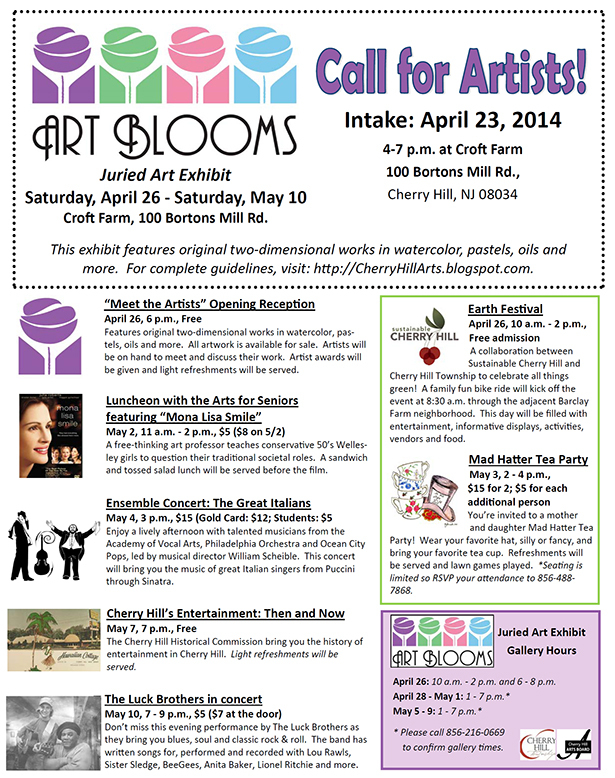 For more information on the Cherry Hill Arts Board, upcoming events or to participate in the Art Blooms Juried Art Exhibit, click here or visit http://CherryHillArts.blogspot.com. For more information about Sustainable Cherry Hill or detailed Earth Festival information including a list of sponsors and vendors, please click here or visit www.sustainablecherryhill.org. For more information & guidelines: 856-488-7868 or Arts@CHTownship.com. To download a prospectus, visit http://CherryHillArts.Blogspot.com.